During warmer months, you can find almost unlimited affordable produce at farmers markets and from your own garden. But produce doesn't last very long — unless you know how to preserve it. Here are a few methods you can use to preserve the food you have now so you can enjoy it months, or even years later. You can preserve fresh herbs such as mint, cilantro, rosemary, sage, oregano, and dill by hanging them to dry. Roast soy beans and pumpkin seeds in the oven on a baking sheet to dry. Most vegetables have better taste, color, and texture if you blanch or steam them before freezing. 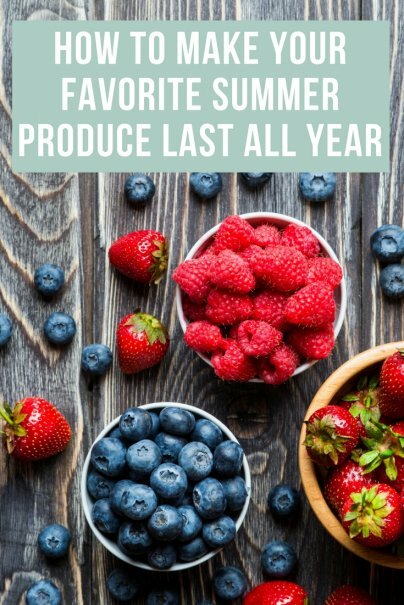 Some good candidates to freeze are: asparagus, broccoli, greens, okra, peas, peppers, pumpkin, tomato, blueberry, cherry, cranberry, peaches, pears, rhubarb, and strawberries. Another way to use your freezer to preserve your produce is to cook up a big batch of soup with your vegetables and freeze it. You'll need a freezer and an airtight storage container to preserve food by freezing. The important thing is to make sure you have an airtight seal to prevent your food from drying out and oxidizing in the freezer, otherwise known as freezer burn. The better your container, the longer your food will last in the freezer and maintain its quality. You can get a vacuum sealing system that includes a vacuum pump and a few heat-sealable bags for around $60. If that's too much, look for a hand vacuum pump starter kit with zipper bags for around $15. The cheapest way to get started is to use thick plastic zipper bags intended for freezer use and squeeze the air out manually before zipping closed. You can get a box of 28 gallon-sized freezer bags for about $5. For foods with high acid content such as fruit, fruit juice, jelly, jam, tomatoes, and pickled foods, you can use a simple water bath canning method that does not require a pressure cooker. Water bath canning involves submerging jars of produce in a very large container of boiling water. I use a large pot of boiling water, Mason jars, lids, and bands to preserve my salsa made with vinegar, tomatoes, and green peppers. You can add corn, hot peppers, and lots of other ingredients to make a unique and tasty salsa. The jars and bands are reusable, but the lids should be used only once. If you want to expand into canning of other produce, you can get a range-top pressure cooker for around $100, depending on the capacity you need. This allows higher temperatures to be reached during canning to ensure that harmful bacteria are killed, avoiding food spoilage or food poisoning. Low acid foods canned with a pressure cooker are safe and nutritious for many years after canning. Cellaring is a technique of preserving fruits and vegetables by using a space in your house that you keep at about 32ºF to 40ºF with high humidity. These conditions slow decomposition and prevent dehydration and withering. Beets, cabbage, carrots, onions, potatoes, parsnips, garlic, apples, and winter squash are some things that can be stored during the winter in a root cellar. You may be able to make a root cellar in a cold corner of your basement, or you may be able to dig a hole below the frost line and place produce in a container to preserve it. Pickling is a way of preserving vegetables by heating them in a vinegar and water mixture. This method of pickling does not involve fermentation, and is the way most store-bought pickles are produced. Cucumbers, beets, and okra can be easily made into delicious pickles. Add sugar and spices such as cloves and dill to the vinegar mixture to get the flavor of pickles that you like best. You can keep your homemade pickles in a container in the refrigerator for a few weeks, or use water bath canning to preserve your pickled produce for the long haul. Fermentation is a method of preservation that changes the chemical properties of your produce, converting it into a new form that can be stored for a long time. In fermented pickled produce, the sugar in vegetables is converted into lactic acid by lactic acid bacteria. In fermented beverages, the sugar in fruit is converted into alcohol by yeast. Cabbage can be fermented into sauerkraut or kimchi, which is tasty and rich in vitamins and minerals. Vegetables can be fermented into pickles that have a shelf life of six months or so. Use pickling salt or kosher salt when making fermented pickles since regular salt is iodized and contains anti-caking agents that can result in cloudy brine and reduce the quality of your pickles. For making sauerkraut, kimchi, or fermented pickles, you can get a set of fermentation lids to put on Mason jars for about $35, or a fermentation crock with weights for $60. Grapes, berries, and fruit juice can be fermented into wine or hard cider. Honey mixed with water can be fermented into mead. When bottled, these fermented beverages last for years and can even develop improved flavor with aging.